Ready to Bike with Two! Bike riding has always been a love of mine. I grew up watching my mother ride her bike and walk more often than seeing her sit behind the wheel of a car. In fact, she hated being in the car. She would much prefer to hop on her two-wheeler when doing errands around town or to go on her evening ride down the bike path to the Queen Mary. I would see her come home from her ride feeling so refreshed and exhilarated. She was full of life instead of drained by life. This is the same feeling I now share when I ride my bike with daughter. For most of 2009 I was pregnant with my first little miracle, Mila. That didn’t stop me from bike riding all the way up until a month before her birth. When she arrived in November my bike hibernated while we did the same. I enjoyed my time of rest and bonding with my new baby and trusted that by the time Mila was around a year old that we would again be ready to experience the wind running through our hair and feel the warm sun on our skin when traveling from point A to point B instead of both of us being strapped into a metal tin can on wheels. Sure enough when Mila was 16 months we were both ready to be out on the open road again. This time instead of being inside my womb she was safely held by her bike seat and helmet. I was on cloud nine riding with her for the first time we rode together on my new beach cruiser. We were both fearless and giggling the whole way. Riding around the City of Long Beach I was amazed to see very few if any other mothers riding their bikes with their young children. I would ride Mila to a parent toddler class once a week and many of the mothers were so amazed and inspired to see me riding with my young daughter. One mother I am close with in that class made the switch from car to bike. It is such a win-win for the mother and child. I get my exercise and feeling of freedom for the day and so does my child. It is a more vibrant experience, I feel, smell, hear, and see so much more. In 2011 I became pregnant with my second child, Sage. Again I rode my bike with much joy and enthusiasm up until a few days before she arrived. Sage is now 12 months old and I on the lookout this time for an amazing cargo bike. 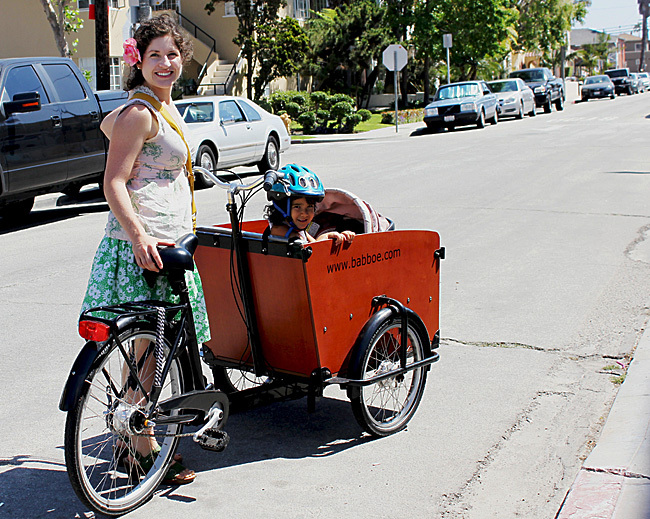 I want to embody what I want to see more of in the city of Long Beach….Mom’s on cargo bikes. Keep your eye out and let me know your recommendations for biking with two.